Seeking Health Olive Leaf Extract is a dietary supplement in the composition of which there is the highest-quality extract from olive tree leaf, standardized for the content of oleuropein – a strong phenol compound responsible for the therapeutic effect of the product. The supplement supports natural defense mechanisms of the organism and contributes to the improvement of the general state of health. It is recommended to people who have weak immune system, frequently get sick and fight with recurring infections. The preparation brings many benefits for the cardiovascular system, influences key metabolic parameters, therefore it may be a valuable element of the prophylaxis of atherosclerosis, hypertension, diabetes and other chronic diseases. European olive (Olea europea) is a long-lived, evergreen tree in the family of Oleaceae. The researchers paid attention to the fact that it is exceptionally resistant to the attacks of pests. Studies on phytochemical compounds of leaves led to isolating many therapeutic substances, among which the highest activity is demonstrated by a polyphenol known as oleuropein. Apart from this, the leaves contain considerable amounts of triterpenes, flavonoids (luteolin and kaempferol), phenol acids and coumarins. Oleuropein has strong antibacterial and antiviral effect. It inhibits replication of many pathogens, prevents their fitting in cell walls and absorption, which limits spreading of microbes in the organism. The effectiveness of olive leaf extracts was proven in relation to the bacteria Salmonella typhi, Vibrio Paraemoliticus (responsible for the ailments of the digestive system), Streptococcus aureus, i.e. golden staph (even the strains resistant to penicillin), Klebsiella Pneumoniae and E. Coli. Oleuropein also fights rotaviruses, rhabdoviridae (causing viral hemorrhagic septicemia in fish, dangerous also to people), herpes virus, viruses responsible for hepatitis, flu virus or even HIV. Phenol compounds present in olive leaves are characterized by exceptionally high antioxidant activity. Their characteristic structural features (i.a. the presence of three hydroxyl groups) intensify the ability to sweep the excess of free radicals from the organism. They also lower the strength of oxidative stress, which was confirmed by the examination of malondialdehyde – the basic oxidative marker of call membrane damage. Oleuropein contributes to increasing the production of natural antioxidants in the organism – superoxides dismutase, catalase, alkaline phosphatase and glutathione. The majority of flavonoids appearing in olive leaves has anti-inflammatory properties. In the course of research it was proven that they inhibit the activity of COX (cyclooxygenase enzyme responsible for inducing inflammation and pain) with the strength comparable to the popular drug – ibuprofen. Because of this, olive leaf extracts are often used in the therapy of bone and joint inflammations. Olive leaf extracts help to regulate lipid profile. They contribute to lowering the concentration of triglycerides and low density lipoproteins (the so-called „bad” cholesterol) and at the same time they increase the level of the positive HDL fraction. 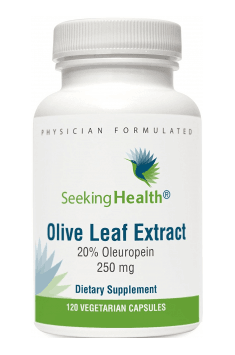 Oleuropein prevents oxidation of LDL cholesterol, i.e. inhibits the process leading to atherosclerosis. Olive leaf extracts facilitate the flow of blood to blood vessels and contribute to lowering excessively high blood pressure. Hypotensive effect is possible thanks to improving the function of endothelium of blood vessels, decreasing tension in blood vessel walls and the ability to widen blood vessels. It was also proven in the studies that oleuropein is a gentle inhibitor of ACE (angiotensin convertase enzyme). It means that it uses the same mechanism of lowering pressure that is used in pharmacological drugs in treating hypertension. Hypoglycemic activity of olive leaf extracts is realized by means of two mechanisms – strengthening of releasing insulin, induced by glucose and increasing glucose uptake by peripheral tissues. Additionally oleuropein slows down digestion of starch. Studies with the participation of people suffering from diabetes proved that supplementation with 500 mg of olive leaf extract a day led to considerable decrease of glycated hemoglobin concentration (HbA1c), a standard marker of long-lastingly increased level of sugar in blood in diabetics. The level of insulin on an empty stomach was also decreased. A study carried out on rodents also led to interesting conclusions – rats fed by unhealthy, high-fat and high-carbohydrate diet, in which all typical symptoms of metabolic syndrome were developed, after implementing olive leaf extracts to their diet (without changing the diet) had considerably better results of all metabolic parameters and in certain cases the values were restored to proper laboratory values. Olive oil extracts improve the state of endothelium in blood vessels, thanks to which they bring many benefits for the cardiovascular system. Endothelial cells play a key role in maintaining proper blood flow and blood pressure. Dysfunctions in this area constitute an important factor in atherosclerosis pathogenesis. Polyphenols from olive leaves support endothelium in a range of different ways. They increase the production of nitric oxide, which helps to relax blood vessels. They limit the synthesis and activity of the compounds from the class of matrix metalloproteinases – their excessive expression degenerates the cover of blood vessels, thanks to which they become more susceptible to damages. Oleuropein decreases the activity of many compounds responsible for the adhesion, i.e. pathological adhesion of platelets to arteries, leading to narrowing the lumen of the arteries and the creation of atherosclerotic plaques. It also has anti-aggregative effect – weakens the ability of platelets to agglutinate, which lowers the risk of the creation of clots and thrombi and consequently it prevents heart attacks and strokes. Summing up, Olive Leaf Extract is a preparation which may help in achieving all positive effects that applying Mediterranean diet brings, even without changing the way of eating. Scientists proved that for the majority of benefits that Mediterranean diet may bring, not olive oil, but oleuropein is responsible. Olive leaf extracts provide large amounts of oleuropein, therefore they are an incredibly promising means in the prevention and treatment of hypertension, diabetes, heart diseases and joint inflammations. Olive Leaf Extract 120 caps. As a dietary supplement use 1 capsule daily with a meal. Strong concentration of the active substance guarantees effectiveness and proper strength of effects of the preparation. For prophylactic purposes use 1 capsule daily. The supplementation is worth applying in the period of organism’s weakness, during illnesses and in case of bacterial infections. The product is recommended for people endangered with atherosclerosis and cardiovascular diseases (the factors increasing the risk are: hypertension, increased cholesterol level, obesity).